Hi!! Kristen here! 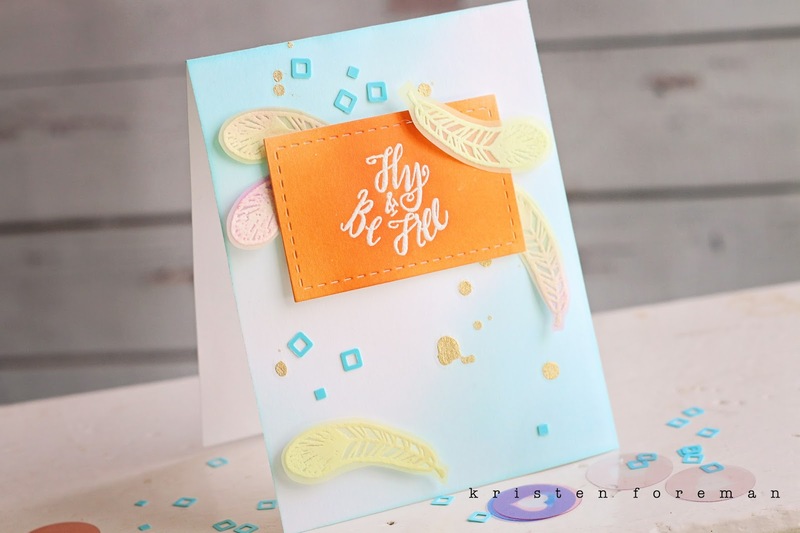 Today I'm showing off two cards using the March Embellishment Kit! The kit is jammed full of goodies and you'll just love everything in it! For the first card, I used the stamp included in the kit from Neat and Tangled. I stamped the image on a piece of paper and heat embossed it with white embossing powder. I then blended orange around the image. I also stamped multiple feathers on vellum with Versamark ink and then covered them in white embossing powder. I took different colors and blended them together on top of the feathers. For the base of my card, I blended blue ink around the edges and dropped gold spritz spray on the card. I adhered it all together and added some of those awesome sequins! For my next card, I first started with a piece of white scrap. I blended yellow, pink, blue and green together. I then die cut love [from the kit] and with another die I had laying around, I die cut the speech bubble. On a piece of scored white cardstock, I added a strip of the washi tape that was included in the kit. I then randomly placed the embellishments and added my own sequins. It was a super fun and easy card to make!! Thank you so much for stopping by the blog today!! :):) Make sure to check out the embellishment kit HERE!